Enjoy the beautiful sight of the rainbow on Rainbow Fortunes at Wicked Jackpots! This entertaining game is powered by IWG and is very easy to play. Plus, it is packed with 2 bonus rounds which add some spice to your game. Discover a lovely scenery which is similar to the beautiful Irish landscape and learn about the popular legend of the pot of gold at the end of the rainbow. Behind the many cells, you can see on the 5x5 grid on which different symbols are hidden. These are the Star, Diamond, Heart, Horseshoe and Lucky Clover. This colourful game is playable on a desktop or mobile device. You can begin by selecting a ticket cost on Rainbow Fortunes using the + and – signs on the Ticket Cost field. After purchasing it, move your cursor to pick 1 cell at a time or press the Reveal All tab to unveil all of them. Match at least 3 similar symbols horizontally, vertically or diagonally to trigger a win. Bet Levels: Bet levels are unavailable on this game. Amount of Paylines Selection: Paylines are not used. Coin Values: The ticket costs are as follows: $0.20, $0.50, $1, $2, $5 and $10. The 2 Bonus icons on Rainbow Fortunes are the Pot of Gold and Wooden Plank which help to activate the 2 bonus rounds. When you collect 3 Pots of Gold, you can trigger the Pots O’ Gold Bonus Round. During the game, simply tap one of the 3 Pots shown to win the amount revealed as the round ends. Reveal a Wooden Plank to enter the Lucky Barrel Bonus Round on Rainbow Fortunes by clicking on the Spin button. You can then earn the prize amount on which the wheel lands. Keep on spinning the wheel until it stops on “Collect”. 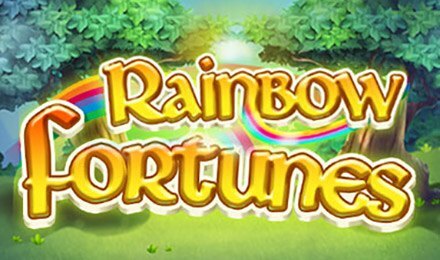 Launch the innovative Rainbow Fortunes game at Wicked Jackpots and have plenty of fun!